Rebecca J. Gomez: WHAT ABOUT MOOSE? Launch Day! WHAT ABOUT MOOSE? Launch Day! They say not to start out writing a picture book with a lesson in mind. Write the story, they say, and let the lesson work itself out as you go. Generally, I agree with that rule. But when Corey and I wrote WHAT ABOUT MOOSE? that's not what happened. It started when Corey was...inspired?...by her bossy-pants daughter. "Let's write a story about bossiness," she said to me one day. We just so happened to have the perfect group of characters to work with; they were from the very first manuscript we ever wrote together. From there we had to decide what this group of friends would be doing, and which friend was the most likely to get carried away with bossiness. To be honest, the details are a little fuzzy now, but it wasn't too hard to decide that the friends should build something and that Moose would get a little megaphone happy! That was NINE years and many drafts ago. And now, WHAT ABOUT MOOSE? is here! 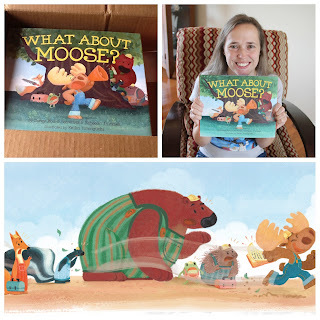 So if you have a bossy little moose in your house, or if you just enjoy reading fun, rhyming stories with your kids, I hope you'll check out WHAT ABOUT MOOSE?! P.S. Also, the Rafflecopter giveaway for a signed copy of WHAT ABOUT MOOSE? ends tonight!